Before starting the History Unwound Retreat (which is scheduled for March 13-15, 2015 by the way), I have always been fascinated by period fashions. Whether it be 12th century Japanese robes, 20th century fisherman sweaters, and ancient Viking dress, I am intrigued by not only the “what” but also the “why” such items were worn. Researching on these fashions has given me an excuse to get hoppily lost in various books and websites. Recently I came across an 8-inch stack of mint “Golden Hands” craft magazines that were being given away at my guild in Gloucester, VA. Because I work in the publishing and marketing sides of the fiber industry, I am always curious about how designs and ideas were portrayed. I found a treasure trove of designs and patterns for knitting, crocheting, tatting, bobbin lace, sewing, embroidery, and even macrame. My favorite find was the not-so-often articles aptly titled “Collector’s Piece” where older textiles are shown and briefly discussed. 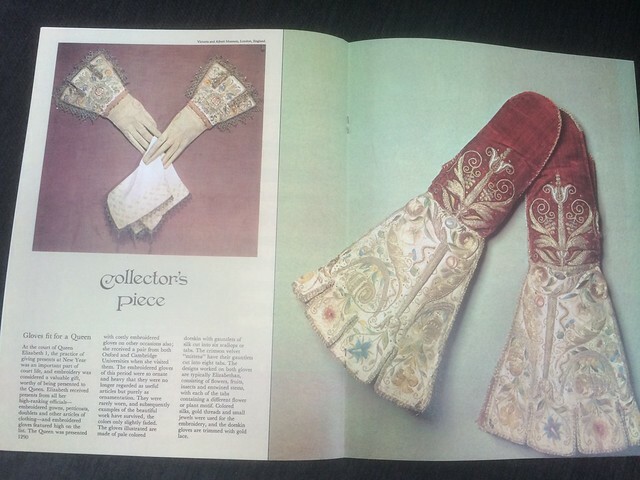 Issue “Part 65 Volume 5” shows a pair of gloves gifted to Queen Elizabeth the First on the left and a pair of elaborate mittens featured on the right. Both accessories are part of the Victoria and Albert Museum in the United Kingdom.